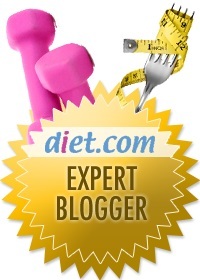 The official expert blog for Diet.com - reporting on the latest news in Diet, Health & Fitness. » Quick and Yummy Pasta Salad! So you're in the supermarket, making your way through the produce aisles, and nestled among the many types of oranges and citrus fruits, there it is - the grapefruit! Have you been steering clear of grapefruits, or are these colorful citrus fruits already part of your weekly menu? If you're stuck in a rut of eating the same oranges, apples, and bananas week after week, maybe it's time for you to branch out and try a new fruit! 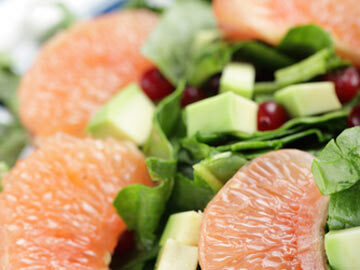 Grapefruits are a relative of the orange - a sour citrus fruit that's packed with Vitamin C and fiber. The pink and red varieties of grapefruit also contain cancer-fighting lycopene (just like watermelons!). 1. Baby Greens Salad with Grapefruit: Grapefruit over endive and delicate baby greens is balanced nicely by Dijon vinaigrette and makes a stunning presentation. 50 Calories per serving. 2. Avocado Fruit Salad Over Spinach: Tart, sweet, crunchy and creamy - all in one dish! This colorful medley will surprise your taste buds with bursts of flavor. 202 Calories per serving. 3. Warm Grapefruit Delight: The sour taste of grapefruit is balanced nicely by cherry-flavored liqueur and caramelized brown sugar in this outstanding (21+!) dessert recipe. 200 Calories per serving. 4. 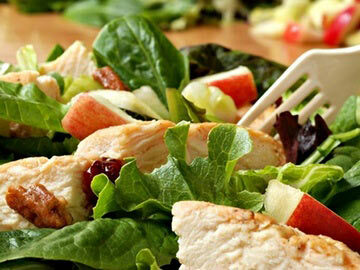 Chicken & Fruit Salad: Try this simple but incredible dish today for lunch or dinner. You'll be on your way to meeting your quota for fruits, veggies and protein! 370 Calories per serving. 5. 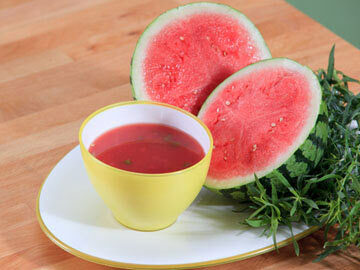 Jeweled Watermelon Soup: Sweet watermelon and pomegranate are complimented by pink grapefruit in this sweet and smooth creation. Makes a great dessert on warm summer night! 130 Calories per serving. DID YOU KNOW? Do you currently take any medications? 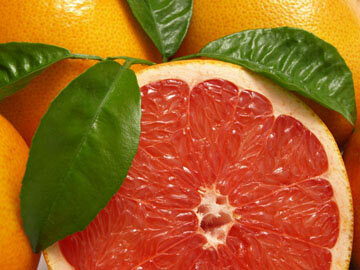 Before you start eating grapefruits, you may want to make sure that grapefruit won't interfere with your medications! 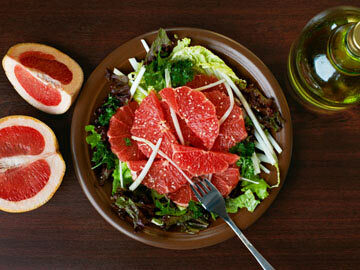 Read more about grapefruit drug interactions here. What's your favorite way to eat grapefruit? Share with us!! Did you know that Diet.com has a Premium Diet Plan you can follow? Choose your Meal Plan and your Exercise Plan, and get the tools you need to succeed in your weight loss goals. Upgrade today!